I am learning to love big statement piece jewelry. I have fruit-punch colored hair, people are going to look at me anyways. I have not always adored such large pieces of creativity, in my blonde/black/brown haired days, I liked simple and plain necklaces. I decided to take a necklace that didn't get much use and turn it into a (bright, fun, silly) necklace that I would wear all the time. It seemed like a good idea at the time... Let's recycle it into something fabulous! 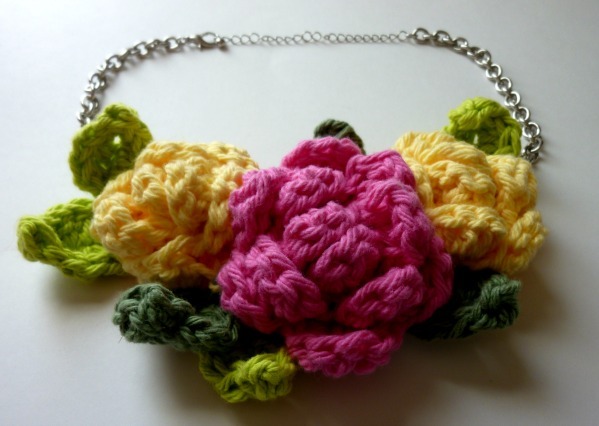 If you like jewelry that makes people look twice, this giant rose statement necklace will be right up your alley! Use the darker of your rose colors (or, if you choose to make all of your roses a single color, just use that color! LOL!!) I made 4 orange bases for my 2 yellow roses, and 2 dark pink bases for my 1 pink rose. Fasten off, leaving an 8" long tail for sewing. Weave in the center end. Starting with the base for the center rose, sew the rose bases together, sandwiching the necklace in between the pieces. Stitch the bases together where they touch to make the piece more sturdy. It should look like the picture below (on both sides!) when you're done. Weave in any loose ends. R1: dc in 3rd ch from hook, dc, hdc, (sc, dc, sc) in last ch sp, continue to the back of the chain and hdc, 2 dc, sl st to center base of leaf. Fasten off, leaving a long tail to sew leaves on to roses. Weave in other end. 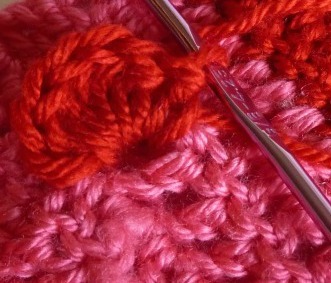 Using picture below as a guide, sew 3 leaves to the outer edges of the rose base. 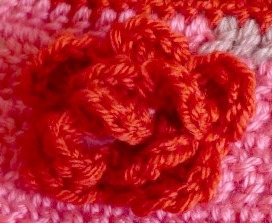 You're going to want to made a circle of petals, so move to the next spot on the edge of the rose base and go for it! 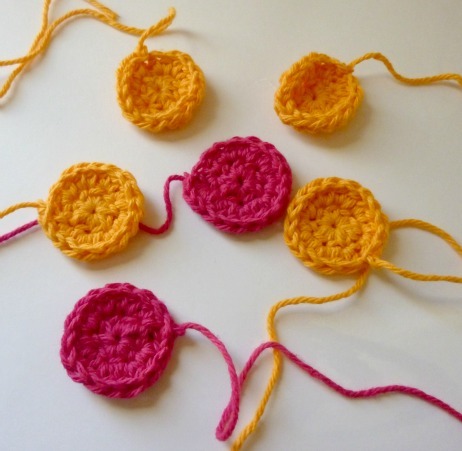 Add more petals in the same manner, placing them so that they form a ring. Connect the last petal to the first petal with a slip stitch to finish the first "round" of petals. Now, add a second (smaller) circle of petals in the center of the outer ring. 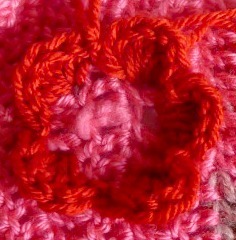 There will be a little hole in the center, add a petal right in the middle for the center bud of the rose. I recommend doing an outer ring of 5 petals, a center ring of 3 petals, and 1 petal in the center. Repeat with the other 2 roses on your necklace. 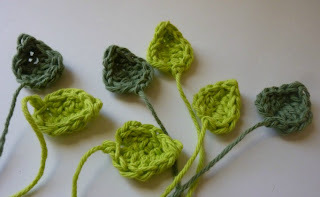 Now sew in the remaining leaves, so that it makes your floral arrangement look full and lush! 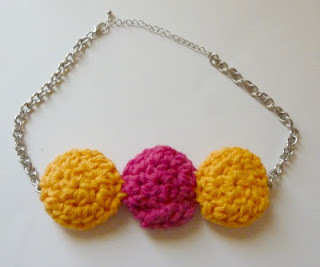 No one will ever guess that your gorgeous designer statement piece was made out of yarn scraps and a recycled necklace! Looking fancy has never been this good for the environment! LOL!! 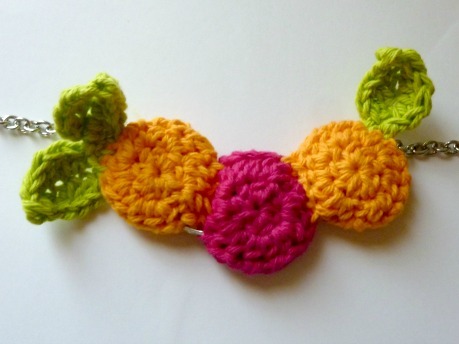 For more recycling with crochet projects, see the January 2013 section of my Free Crochet Patterns page. The necklace is a great idea! 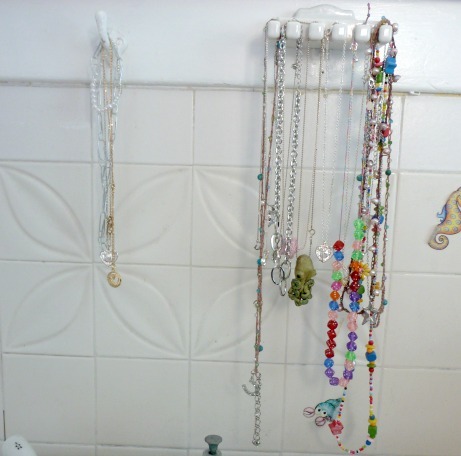 I might do this sometime...I have a TON of necklaces I don't wear that are all tangled up in my bedroom. Hi Kaleigh! Thanks! My mom let me dye the sides of my hair blue when I was about your age, because I promised that I wouldn't drink at parties if she let me do it. It was a good deal for both of us. 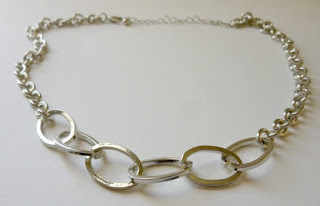 It was really fun to make this necklace. I'd love to see you do your own version, maybe with some of your own designs! I dyed my hair bright red for the first time when I was 14, my mom helped. Love the shade your hair is now. I wish I could do mine right now but I have to wait a few months till I have money. This is simply great! You just gave me another idea! Thank you so much! Hi Eve! Thanks! It was really fun! I was able to make 2 of this already. Can't wait to blog about it! Thanks to your innovative ideas from your very creative mind. Ooh, I feel a new project coming on. I know lots of my girlfriends would love these...maybe birthday gifts this year. Seriously! I do too! 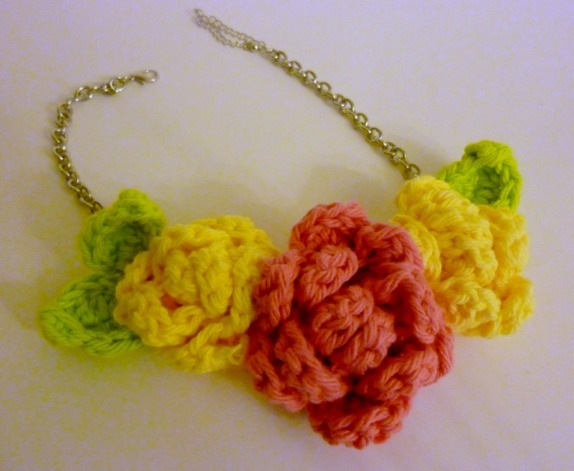 Rose necklaces for everyone!! So adorable!!! Love the colors! Thanks so much for sharing the great tutorial! Would love to have you visit me sometime. I seriously doubt that I would wear such a large piece around my neck, but....this is too gorgeous to ignore, and as such I will work to figure out where to use this. My thoughts are....that this would work extremely well on one of my large straw hats which has nothing in the way of accent and is needing a bold hat band that will not be diminished by the size of the hat itself. 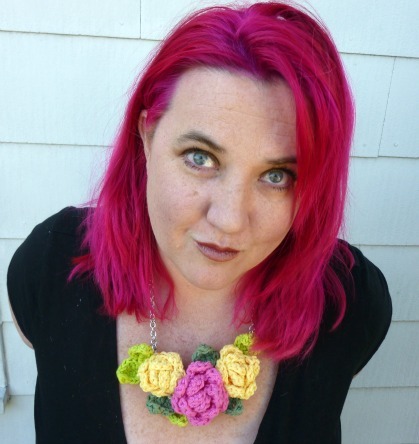 THIS Rose Necklace...is purrrr-fect!! When my middle son was 15 he wanted to dye his hair green. I agreed on two conditions: 1) I'd buy the dye to ensure it was safe and would wash out over time and 2) if his grandparents came to visit he'd disappear cuz it definitely would cause problems & lectures of what a bad parent I was. He readily agreed. Just about the time the dye had washed out my wonderful sister-in-law (and his beloved aunt) passed away from cancer. Days before he asked if he could dye his hair again, and because we knew her passing was imminent I asked him to wait until after the funeral. Again, he agreed, and while I was serious about getting him more dye, he never asked again. His friends thought I was the coolest of moms and their moms thought I'd lost my mind..lol. My hair in that picture is Flamingo Pink by Manic Panic, but I colored it over the top of very faded Vampire Red (also Manic Panic, LOVE that stuff!). I love Dr. Who too! !